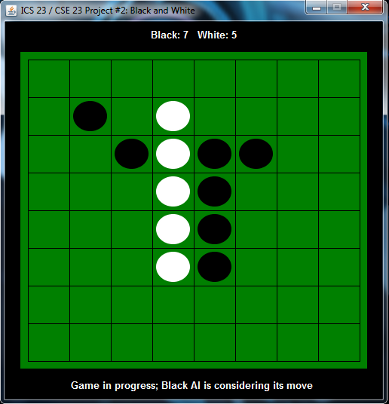 Othello AI uses various approaches to provide a competitive, time restrained AI for playing the game Othello. The AI uses game trees for organizing moves. Heuristics were designed based on piece count and placement to add weights. Variable tree depth was implemented due to the time limitation of 5 seconds per move and to get the most out of faster hardware. Tree depth depends on remaining time as all moves are required to finish within 5 seconds (even allowing for half a level to be searched). Othello AI took home 2nd place when put in competition against roughly 50 others. To play a game (or watch the AI play against itself), download and run the executable java file at the top of the page.